This lovely ballet tutu has stretch nylon leotard bodice with ties on shoulder. 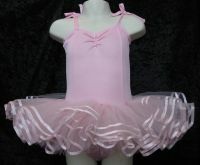 The skirt has four layer of tulle for a fuller finish. The top 3 layers have ribbon trim and the very top layer has scattered sequins to finish off.